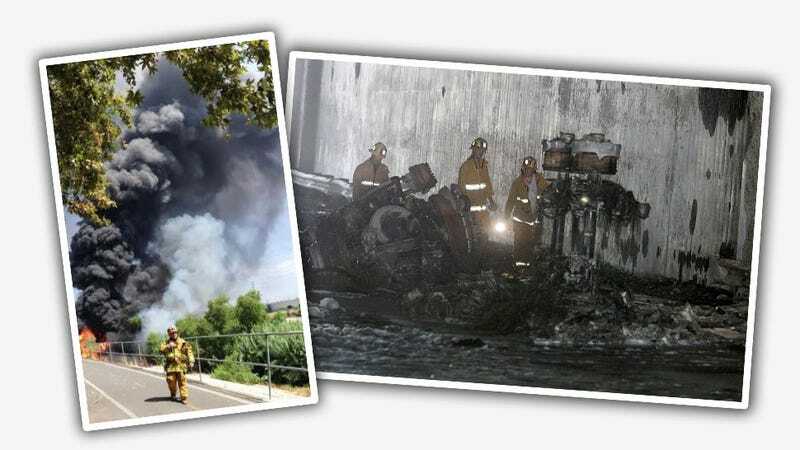 A tanker truck carrying 7500 gallons of fuel caught fire in an interchange tunnel between the 2 and 5 freeways, causing a massive fire, huge plumes of smoke, and sending fuel into the LA river. Luckily, no one seems to have been hurt. The driver, 52-year-old Jose Castanon of Bellflower, CA, speculates that the cause of the fire is related to a blown tire the truck suffered. While the Los Angeles fire department was able to extinguish the blaze, possible structural damage to the interchange will keep that section of the 5 freeway closed until the damage can be assessed and/or repaired. This will probably make commutes long and tedious for many LA drivers, a situation which I'm sure they'll find absolutely stunning. The section of the LA river near the fire also happens to be one of the more scenic sections of a river that in many places resembles a drainage trench. That section had also recently been opened for hiking, boating, and other recreational activities for the first time in decades. Some river sections just can't get a break. As an aside, this is quite near my house, and only about a mile away from where I installed my Beetle's engine.